It frequently puzzles me that programming seems to be dominated by men when the founders of programming and many of the greatest programmers were women. I read an article that this may be contributed to by early home computers being advertised as game systems for boys, which tipped the scales temporarily. 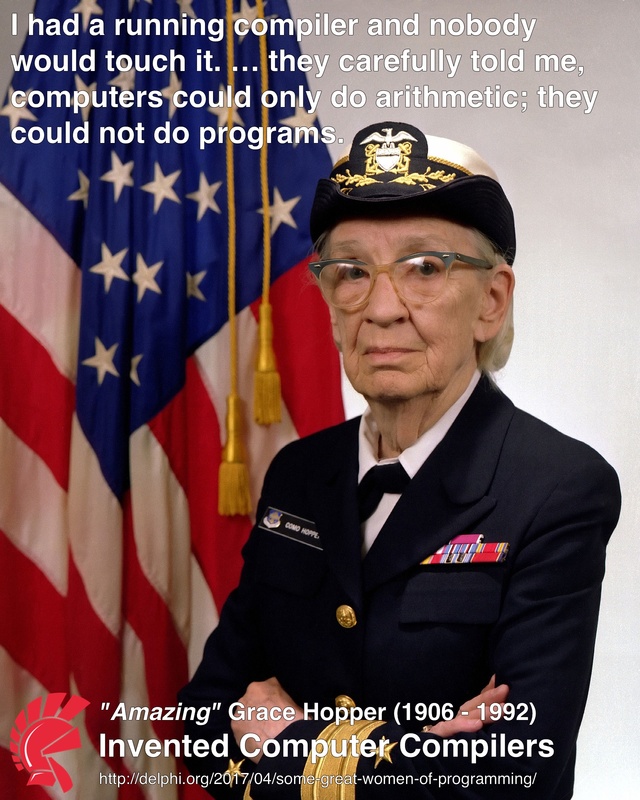 Here are a few amazing women who pioneered the computer programing field. 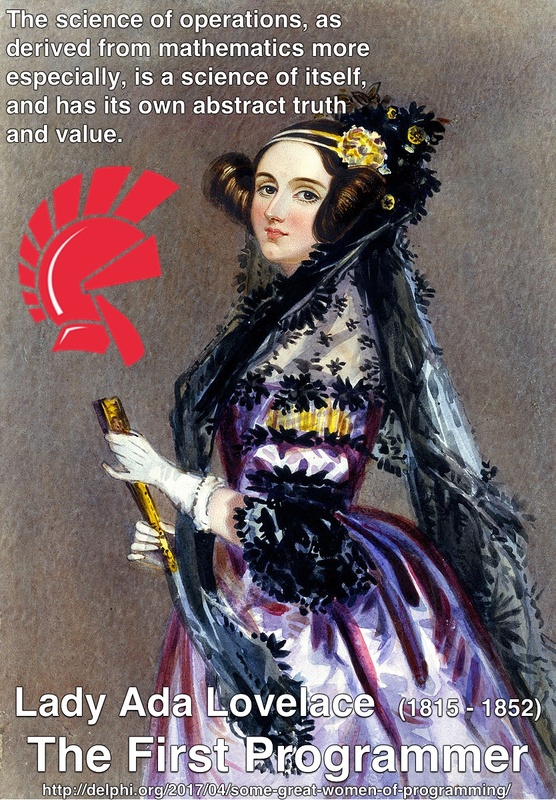 Lady Ada Lovelace (1815 – 1852) Invented the idea of programming. Her father Lord Byron was known for his poetry. Lovelace was a poet of mathematics. [The Analytical Engine] might act upon other things besides number, were objects found whose mutual fundamental relations could be expressed by those of the abstract science of operations, and which should be also susceptible of adaptations to the action of the operating notation and mechanism of the engine…Supposing, for instance, that the fundamental relations of pitched sounds in the science of harmony and of musical composition were susceptible of such expression and adaptations, the engine might compose elaborate and scientific pieces of music of any degree of complexity or extent. –As quoted by Menabrea, Luigi (1842). “Amazing” Grace Murray Hopper (1906 – 1992) invented the idea of human readable programming languages, then created COBOL. She achieved the rank of Rear Admiral in the US Navy, then had a Missile Destroyer and Cray Supercomputer named after her. The term debugging was attributed to her discovering a moth in a computer at one point. She carried around a nanosecond worth of wire to help people understand the relation between size and speed of computers. Adele Goldstine (1920 – 1964) wrote the complete technical description for ENIAC, the first electronic digital computer. 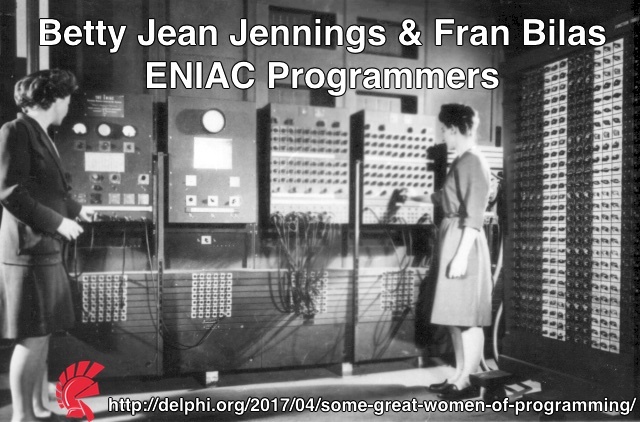 And the original programmers for ENIAC were also all women: Kay McNulty, Betty Jennings, Betty Snyder, Marlyn Meltzer, Fran Bilas, and Ruth Lichterman. Jean E. Sammet (1928 – ) developed the FORMAC programming language, a variation of FORTRAN. Margaret Hamilton (1936 – ) Margaret Hamilton was the Director of the Software Engineering Division for the MIT Instrumentation Laboratory during the time that her division developed the on-board flight software for the Apollo space program. Also, in 1986 she became the founder and CEO of Hamilton Technologies, Inc. in Cambridge, Massachusetts, a company based around the Universal Systems Language. My daughters have as much, if not more, interest in computer programming than my boys. I hope we will continue to see more amazing women in computer programming!